Bethel, Maine, native Troy Murphy of the United States trains in preparation for the men's moguls competition of the 2018 Winter Olympics in Pyeongchang, South Korea, Thursday, Feb. 8, 2018. Motocross used to be one of Troy Murphy’s biggest passions. That was until a ride with Jeff Yingling changed his life. Murphy had the chance to ride with Yingling, then the head freestyle coach of the Gould Academy Competition Program in Bethel. After watching Murphy ride, Yingling suggested that he try freestyle skiing. Murphy decided to give the sport a shot that winter and he instantly fell in love with it. Murphy, who was born in Bethel, is getting ready to make his first-ever appearance in the Winter Olympics in PyeongChang, South Korea. Qualifying in the men’s moguls competition begins Friday night and continues with a second session on the afternoon of Feb. 12. In 2014, Murphy, in his first season with the U.S. 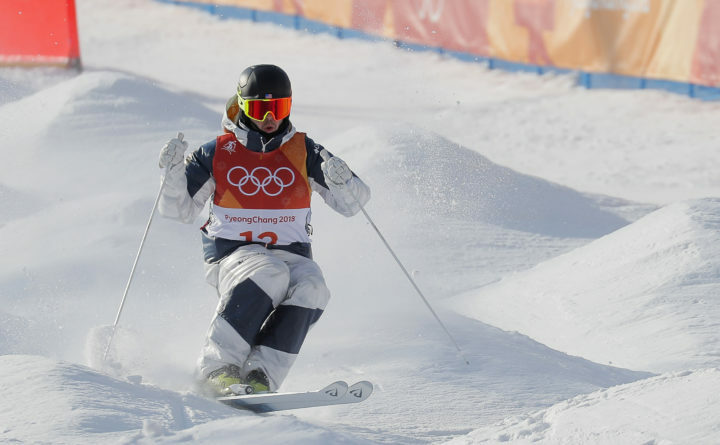 Ski Team, was within grasp of qualifying for the U.S. Olympic moguls team after recording two fifth-place finishes in nine starts, but he fell just short. It gave Murphy, who wasn’t expecting to even contend for a spot on the Olympic team that year, confidence and the drive to qualify for the games in 2018. And he did just that. But Murphy’s path to the Olympics wasn’t always smooth. Throughout the 2016 season, he endured a series of injuries that limited his time on the slopes. Murphy posted six top-10 finishes on the World Cup tour in the 2017 season. Murphy, 25, has struggled as of late in World Cup events. In January, he competed in four World Cup events, posting two 14th-place finishes and two finishes outside the top 30. Despite the slight decrease in Murphy’s production, he said he is feeling “awesome” heading into the games. Before leaving for South Korea, Murphy had a six-day training camp at Deer Valley Resort in Utah. When Murphy hits the slopes in PyeongChang, he’ll have his family, friends and girlfriend there to support him. Colton Wood, a native of Richmond, Virginia, is a freelance journalist and a student at Michigan State University. He has covered several NFL, NBA and NHL games, along with numerous NASCAR weekends and various collegiate sports for multiple publications, including ESPN, USA Hockey, The Washington Times and Florida Today.